Still a better trio. Dr Who still a better trio. Wallpaper and background images in the Harry Potter Vs. Twilight club tagged: harry potter dr who trio harry hermione ron. This Harry Potter Vs. Twilight fan art contains pak, teken, poster, tekst, bord, and schoolbord. There might also be rijbaan, rijbanen, rokkostuum, volledige jurk, rok, jas staart, staarten, witte das, witte das en staart, jurk kostuum, volle jurk, vacht van de staart, white tie, witte stropdas en staarten, straat, stad scène, stedelijke omgeving, stad straatbeeld, and stedelijke instellen. Whoever made this isn't doing the meme right. The point of the meme is to pick a trio that ISN'T good. For example: if you were to take The Plastics from Mean Girls (before Cady joined of course) and wrote "still a better trio" then that would be funny. It works if you don't like Dr. Who. ^ That was a pretty awesome trio. NO! The Hp trio is the best! HP trio is the best!!! 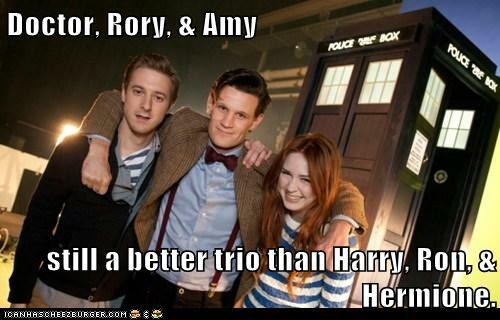 Is the person who made this suggesting that 11, Amy and Rory were not a good trio? If so, then I agree. But they're not better than the HP trio.